Scrabble is a timeless game that has been enjoyed by people of all ages for decades. 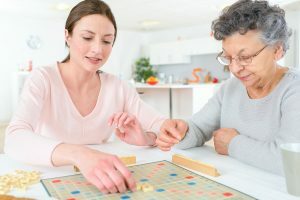 Not only can this board game be enjoyed by older adults, but there are also a number of health benefits to playing it. Elders with memory or cognitive problems can especially benefit from regularly playing this game. If they are finding it difficult to play due to their physical or mental challenges, an elder care professional would be happy to assist when needed. Scrabble works can do wonderful things for the health of people of all ages, but here are some of the benefits that seniors can take away from the game. Lowers the risk of mental illness. This game will keep the elders mind stimulated and engaged, strengthening the brain. As a result, there is a much lower chance of developing dementia or other diseases that affect the brain. Makes you happy. Board games, such as Scrabble, can be a fun activity to do with the elder and other loved ones. Chances are there will also be a great deal of laughing during the game. By laughing, endorphins are increased, which is a chemical in the brain that triggers a feel-good response. Not only will laughing help bring joy to your elderly loved one, but it can also increase the amount of compassion, empathy, and trust the elder and other players have with one another. Reduces blood pressure. Not only will the increase of endorphins promote feelings of happiness, but it can also help to lower and maintain blood pressure levels. Muscles become relaxed and the blood circulates, which will help keep the elder’s blood pressure at a healthy level. Improves the immune system. Because of the positive feelings the elder will have when playing Scrabble, their immune system will be able to ward off diseases and illnesses. When feeling depressed, sad, anxious, or stressed, the body’s natural defenses against illnesses is lowered, increasing the senior’s chances of getting sick. Playing this game will help to keep your loved one healthy. Improves memory. By participating in a game of Scrabble, the elder may be able to better find items around the house. It will get the entire brain engaged, resulting in improved memory and cognitive skills. A game of Scrabble can do wonderful things for the brain and memory, while also promoting feel-good emotions, lowering the chance of getting sick and reducing blood pressure.